Are you are looking for an original or atypical holiday? Do you like to be close to nature? Then going glamping in Dordogne seems to be the best option for you! "Alright but... what exactly is glamping by the way?" you may be wondering. Even if the word is being used more and more and for many years now, it can still be a little mysterious to some of us... which is absolutely normal! Here's s short explanation then, that hopefully will convince you go glamping in Dordogne for your next holidays. "Glamping" is created from the words "glamour" and "camping" which means that it is a comfortable way of camping, based on a respect for nature and tinged with a touch of the unusual. The offers for "glamping" are steadily increasing in the Dordogne. They are a way to experience a rich and authentic holiday while contributing to sustainable tourism. “Glampings” offer a different way of camping, retaining all its advantages and erasing the small inconveniences - lack of comfort, mainly. With a little touch of whim for good measure! Many campsites now offer you to rent what is sometimes gathered under the name "unusual accommodation" - tepees, yurts etc. Perfectly equipped and furnished accommodation, often with an extra cozy and very contemporary vibe, with added high quality amenities and services - SPA, massages, breakfast delivered at your rental etc. To sum it up quite simply, they offer you the opportunity to spend a few days at a campsite as a proper VIP! Our beautiful region is no exception and offers to go glamping in Dordogne are developing at a fast pace. They represent a good way to spend authentic and fulfilling holidays practicing sustainable tourism. Indeed, comfort and lyuxury shouldn't stand in the way of the environment at all. A cabin on the water or in the trees, a lodge tent - the campsites of Dordogne are striving to come up with rentals and services that mix originality and comfort: sleeping in a tepee or above the canopy, children in particular will just love going glamping in Dordogne! 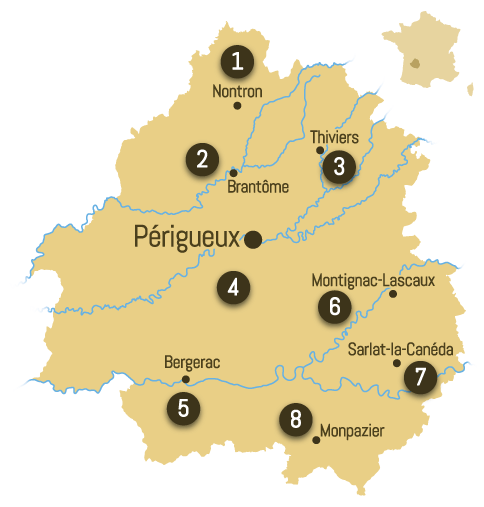 Check the list of campsites below - 2-star or 5-star sites, with pool or by the river - and let yourself be tempted by some of the original proposals of the Périgord campsites. Glamping in Dordogne - a most appealing new alternative for your upcoming holidays or a short weekend break with your partner!